We all know of the pressure during the holiday season, maybe most of it placed on ourselves by ourselves, still, we all strive to be the perfect host to both family and friends. Everyone needs to be entertained, need to be spoiled with great eats and of course you want to place a drink on their hand that is worth commenting on. Every year you try a different eggnog recipe, yet why not make this year, that special year where you ignore all the traditional stuff such as Mulled Wine and Rum & Eggnog and replace it with some of the most sensational alternatives. Everyone loves an interesting drink, it is often a great conversation starter, but most of the time too difficult to perfect and too time-consuming, so here are the quick and super fun drinks you get to serve this year. Stir in all the ingredients into a mixing glass already filled with ice and then fine-strain it into a chilled glass, while the final touch is the coffee bean and orange wheel. Another great coffee themed surprise to served up some deliciousness this holiday season is the Grey Goose Espresso Martini. It is quick to mix and can be served in a number of great ways. Pour it all into a cocktail shaker and give quite the shake, then double strain it into a pre-chilled martini glass and decorate with mint leaves or spice it up with nutmeg. Why make each cocktail individually when you can ready a bowl of it well in advance, forget the Eggnog and rum, it is time to impress your guests with something truly divine. Its quick and easy, since all you have to do is mix all the ingredients in a large punch bowl. Ohh, the Paper Plane is one that should not be kept secret till the holiday season, actually you might look for excuses to make and serve this one! The Paper Plane is again one of those so easy to make that you’ll hardly see it as an extra chore just before the big party, you simply combine all delicious ingredients into a shaker and mix it all up together with ice. Well, there is a whole lot of shaking’ going on, since you need to shake it for around 20 seconds, and once that is out of the way you strain it into chilled glasses and enjoy all the compliments form your appreciative guests. When someone asks you what design style you prefer, it’s often hard for the everyday person to explain, so below we going to break down and simplify some of the design styles you may have heard of. Some key elements in the Mediterranean design style include the layout of the room and how it is built. High arches, plastered walls and tiled or marbled floors are mostly seen in this type of home. Colours include warm, earthy tones; terracottas, browns, creams and golds, and every now and again, a blue or green will be used as a highlight colour in accessories. Fabrics include scattered cushions that resemble tapestries, woven fabrics and cotton or silk rugs. In the living rooms, you will see big comfy couches with rounded edges with some exposed wood as well as decorative wooden tables showing off simple yet beautiful carvings. Bedrooms feature high poster beds and luxurious linens. No one can deny that Mediterranean-style designs are luxurious and rich and welcome you with a feeling of warmth. The contemporary design is one of the favourites among young professionals. Furniture has square edges, creating the three-dimensional feeling of colour blocking. Colouring is normally a neutral colour or two, highlighted with something exciting, giving off the rather cliché but perfectly descriptive “pop” of colour. Black and red, grey and yellow, white and blues are some examples. Another characteristic to take note of is that a contemporary design is rather sparse and minimal, with zero clutter, a coffee table will display a fruit bowl or a candle maybe even a magazine or two, but that’s all, and it will be strategically placed, everything is neat and concise. Rustic designs are the epitome of upcycling. Here you will see unfinished wood everywhere, often whitewashed or painted and sanded down, with handmade nails exposed, and copper tacks along the seams of upholstered furniture. The rougher the wood or metal is, the better. Aged tea boxes are used as accent tables, restored shipping chests are used as coffee tables and pallet wood may even clad the walls. Scatter cushions and woven rugs play tribute to your grandmother’s cross-stitch creations while lampshades are indicative of hessian bags. When you walk into a traditionally styled room, you immediately feel like royalty, you might even find yourself craving tea and scones. This design includes rich, dark wooden floors, soft wall colours, top of the range fabrics and heavy wooden furniture. One of the most important things to consider with this design are the curvy, flowing, regal lines. Overstuffed couches are often full of fringed, plump scatter cushions, while windows are framed with heavy yet highly elegant drapes, that normally hang from the ceiling to the floor. The light-coloured walls display mirrors in bulky gold or silver decorative frames as well as beautifully painted watercolours. This is a wonderful design for the antique lover or someone who has inherited china and silver tea sets as this can all be easily incorporated into the design. Napkin folding is not something new. This decorative art form has been used for centuries to complete memorable table settings. The illustration above is one of the very first traced and was originally published around 1657. Napkin folding is both a hobby and a decorative folding art form used to complete from the most formal to the brightest themed table. It is most commonly seen in the fancy restaurants that often used clean pressed, starched linen napkins to ensure a luxurious look. There are variolous folding techniques and those not familiar with all the folded styles often uses glass, natural or rectangular napkin rings. 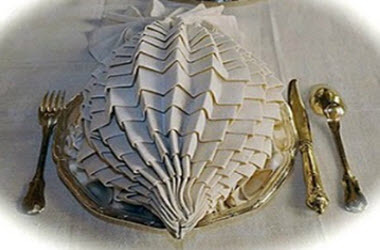 The very first instruction manual on decorative or artistic napkin folding was published by Matthia Gieger in 1639. The German working as a meat carver at Padua enjoyed this hobby for many centuries. But it is also noted that napkin folding was used around 1638 in the times of Roi-Sleil the sun king and Louis the Great. Yet the while shift from neatly folded napkins to the decorative folding art form actually occurred in Florence during the sixteenth century. In Italy it was also the time-period of voluminous clothing at the time, fashion was seen as wealth and one of the greatest fashions of the time was the ballooned sleeves. It is during this time that laying a napkin flat on a plate was no longer in fashion and starched linen napkins became folded in such a way that it could multitask as a centrepiece. The folded napkins depicted many forms including natural elements, architectural form and mythical animals. Folded napkins also became a popular gift to wedding guests and the way these where folded personally by an artist would distinguish the quest of the bride from those of the broom. 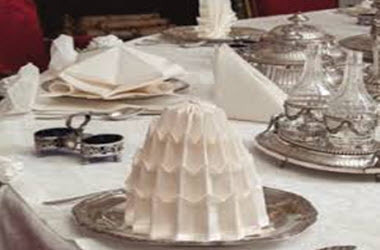 By the mid 18th century in Germany table setting became quite a practice and so did the specific folds of napkins. There was even a school in Nuremberg in the golden age where housekeepers could go to learn the art of napkin folding. It is also in this century that napkin folding became an art form that included table sculptures, folded via precious offered by rulers and butlers where to check that each was folded exactly the same as all others. 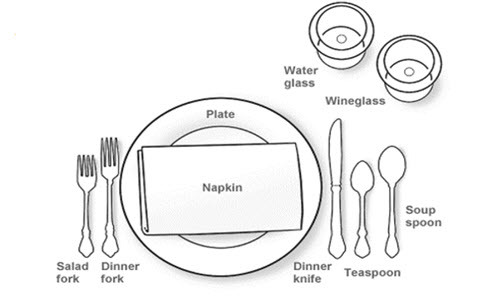 Today, napkin folding is mostly performed for formal dinners, family lunches, Thanks Giving or Christmas celebrations. With hundreds if not thousands of napkin folding ideas, any party can unfold into a masterpiece. Starched, white linen napkins are not as often used as before, and many parties now have to do with paper or paper-foiled serviettes, yet still, the variety of colours and textures makes it possible to provide guests with the most wonderful table settings from tropical to classic to formal. One of the best ways of celebrating Christmas is to ensure your table is beautifully set for the Christmas dinner. 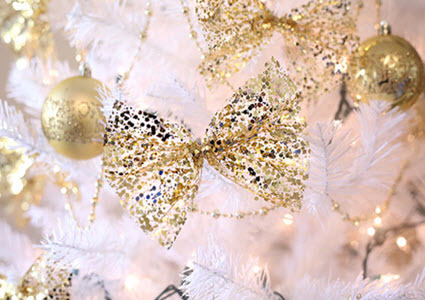 It is one of only a few times a year that the whole family are together and for this truly special occasion you can go as creative as you wish, especially if you decide on white and gold. While the Christmas tree in most homes goes up about one month before, many hosts start planning the layout of the table. An elegant white and gold table is perfect for a large party or just a few family members getting together. It is by far the most affordable option for those on a budget since most homes already have a white dinner set, white tablecloth and white serviettes. While table setting and decorations come naturally to some, others need a few guidelines, especially where to start. 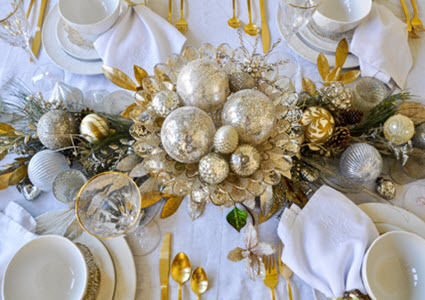 We follow one of the top designers as she gets going with planning her Christmas dinner table. 1. The heart of the table setting is the centre and once you have a striking centrepiece the rest almost shapes itself around it. If you have glass candlesticks they could be all you need at first, by lining up three down the centre you might be on your way to create a centrepiece nothing short of impressive. 2. Depending on the candlesticks you could plan on getting some scented candles, a hint of vanilla could be great as your guests take their seats, and it could give a lovely aroma to your home even before. 3. With the candles as your main piece, the nicest way to enhance the centrepiece is by using fresh cedar garland between the three candlesticks. Another great idea is low tiny fairy lights twirled in white chiffon. While the main colour of the table is white, it might be quite striking to add some green or red decorations for the effect. 4. 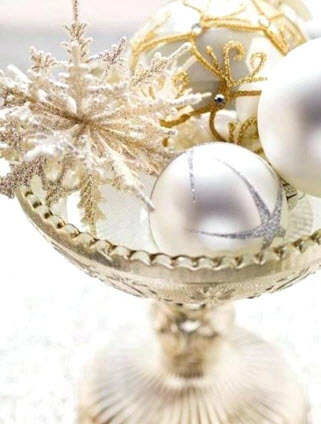 Champagne and gold ribbons tied to ornaments are a fantastic way to add elegance to any table, although it is even more striking when used with white. 5. Why settle for only three candles, if you have more add them to the mix and create a true fest of light with smaller and larger candles all complementing each other. A simple tip if short on candle holders is to remember that they can easily be replaced by tall wine glasses turned upside down to give height to candles. The final touches can be added via the beautiful serviettes, as with all elegant dinner tables the beauty lies in the attention to detail and when it is Christmas you are allowed to go a little overboard. Great ideas are to make use a special serviette ring as it will be the first thing the quest sees apart from the centrepiece, and it is also the one thing everyone gets to use. Start planning your special dinner party now and have fun with decorating a truly elegant setting. Before diving straight into inviting all the big bosses over for a formal dinner party, it might be best to first get to know all the tools of the trade. While most think it is all about planning the menu, it is actually a combination of things, starting from the place setting. The casual place setting is easy and can be remembered by children although it is important to repeat the setting in the same format to make everyone use to it. A few things worth remembering with the casual setting is that the knife blade should always face the plate since it prevents accidents when the knife is picked up. 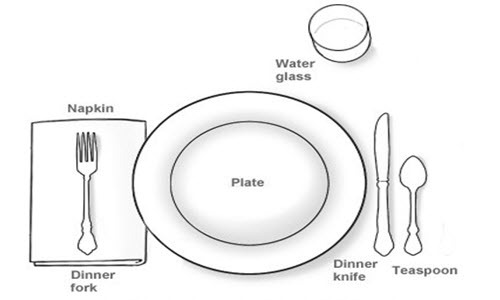 On the left of the plate is where the spoon, drinking glass, knife and the napkin belong. Slight more formal than the casual dining table setting the informal table have a few things added to it, which includes an additional spoon, salad fork, and the napkin moves. With the few items added a casual setting can be transformed into an informal setting and the napkin can actually go anywhere, and should you wish to serve coffee the cup and saucer should be placed to the right top of the soup spoons. Remember this golden rule all liquids do go on the right side of the plate leaving the left for the solids. If you want to impress your important guests then the formal place setting also used at wedding receptions are the one to use. 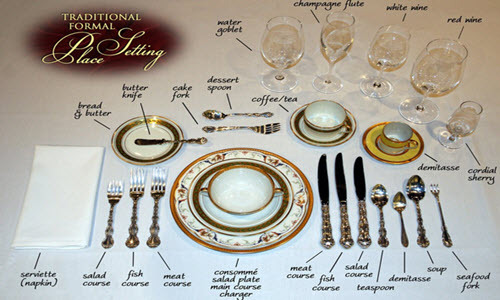 The formal place setting is one of the most commonly used for business and home dinners, although the place card is more seen at large business dinners. A few more things are added to the formal table setting starting with the glasses, extra knives, as well as a cup and saucer. If it is a complete dinner setting plan you need, then the royal place setting is the one to follow, this is what you would need to use for inviting the royal family. When compared to any of the other settings it involves quite a few extra items, the number of glasses increase to five and include a sherry, red wine, white wine, champagne and water glass. 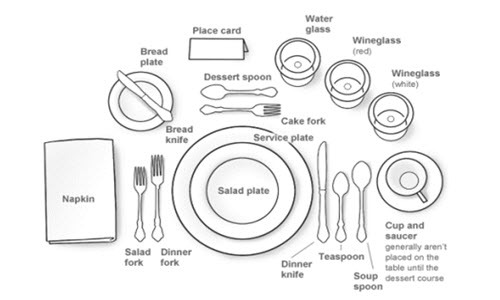 Forks on the left side of the plate include a salad, fish and meat fork while the knives on the right correspond and are joined by a teaspoon, soup spoon and demitasse. The serviette is placed mostly on the left side of the plate, although it seems that again you are free to place it where you prefer. No matter the occasion once you know all the settings you can attend any function and know exactly what to expect, while at the same time you could arrange either a casual, informal, formal or royal dinner at your homebound to impress even the Queen herself. Inventing a luxury sanctuary in your own home is often thought off as an overwhelming task as well as an expense. Upscale décor and opulent furniture are what first come to mind when the term “luxury” is involved, although designing experts say it doesn’t have to be. According to some of the best designers in the world, a few small changes made with the right planning and knowledge are all that is needed to enjoy a luxurious home environment without breaking your budget. The first step before running off to designer furniture shops is to declutter the entire house, and one of the first actions needed in creating a luxurious feel or environment is to simplify. 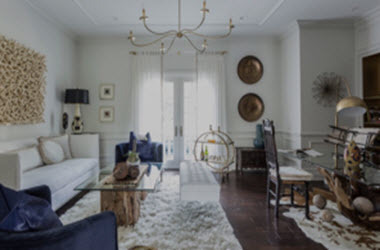 Most people fall in the trap of overdoing rooms via accessories, and a minimalist approach might seem counteractive at first but, in reality, this is the one time where the saying “less is more” have true meaning, and it is vital in creating a luxury home. The most difficult step in the process could be getting rid of furniture that is unnecessary. These include additional side tables or bulky footrests that add to the feel of clutter if it does not have a real function in the room it should go, which allows the rest of the furniture and the statement pieces to make a statement via the space it will have. Once you’ve tackled the accessories, the next step is to group other accent pieces in threes. For example, three coloured glass vases on the entrance table or a group of only three pillows on the sofa make a luxury statement. Only once you’ve grouped and illuminated clutter it is possible to step back and make a few tweaks and plan on items necessary to create the luxurious feel want. An easy update can often be achieved by updating the windows achieved by high-end textures and fabric. Replace blinds with stylish drapes and combined with a clutter-free environment the change will be amazing. Fabric such as linen, silk or textured drapes revitalises an entire room, especially if you opt for lighter shades that lift the room. Avoid cutting off the room, if you have high ceilings use long curtains, at the end of the day living in luxury is all about the attention to detail, which could be achieved even with a small budget, yet there can be no short-cut when it comes to attention to detail. With all the clutter removed every piece of furniture or decoration now deserves the spotlight to make sure everything is worth the attention they could claim, and therefore the drapes play a major part. 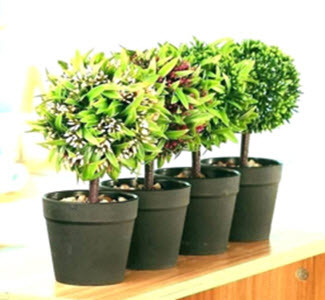 If you add plants to the room, remove all dried leaves they need to look fresh and well cared for, while dust free surfaces are another sign of luxury living in a clutter-free, stylish environment. After a long day at the office or one on the road the one thing that nothing in the world beat is lying down on crisp sheets and fresh bedding. This is the reason why we all should have a favourable styled bedroom. Designing a bedroom that is both functional and stylish as well as calming could be challenging. The most important thing is a great night’s sleep, and we all know to invest in comfortable mattresses, yet when you come to think of it the interior has a huge impact when you finally get the change to relax in bed, and your bedroom should be haven you look forward to every day. What further increases the difficulty of designing the most amazing bedroom could be the range of options available. Bedroom designs are basically endless, while the most popular design styles include classic, elegant, dark features, colour, minimalist, glam and contemporary. The bedroom design style most people desire and often the one used by the least is glam style bedrooms. Glam style bedrooms offer refined elegance, they are calming, and their simple colour palette offers a feel of luxury combined with tranquillity. Soft pinstripes often add to the glamour style suite, and in most cases, the colours used include navy, grey or white. This is the bedrooms that reminds many of a hotel-like feel with many layers of throws and cushions used to make the bed look attactive, and the textures and furniture combine to reflect the perfect classic look enhanced via contemporary touches. While most associates a boutique design with that offered by trendy hotels, there is sumptuous luxury offered by even the most dated rooms. Older bedroom suites could be upholstered in brighter colours and headboards matching other furniture could provide a luscious feel. The most important aspect is to get all the furniture in the same colour which already offers a great base for adding white bedding that could be enhanced via layers of cushions matching the colour of the furniture. 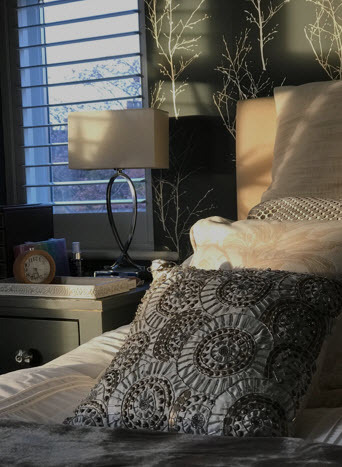 Home Stylist, Chrissy Halton loves a glam bedroom that features deep colours, it makes the bedroom cozier and at the same time more relaxing and peaceful. Halton says the secret lies in the balance of deep colours combined with white bedding, while a touch of colour can be added via cushions or throws. White window treatments are great as it then blends with the deeper wall colours and at the same time matches the white linen, while it allows for easy change just via changing the throws and cushions to add more colour or reach a specific non-permanent look. Red could add a bit of romance, while royal blue could add a touch of luxury especially if embroidered velvet cushions are used, and yes it is all about glam, so gold or silver touches are great to achieve the glam look. Ever admired people who throw an artistic look together at a moment’s notice, they often described as the artistic type. It is the person who can create a stunning centrepiece from a few clippings of the plants in their backyard or use a bowl to lemons to brighten the entire room or grab a few shells to provide an eclectic look to any setting. It is these designs enhanced by elements of nature that can also provide an upgrade to the decoration of any room in your home, they cost nothing, or they are most affordable depending on what you buy, and yet they make a world of difference. While most hostesses pre-order a bunch of expensive flowers to ensure the dinner table are sensational, it is often the host using fresh produce that makes a lasting impression. Pomegranates and lemons are easy to dry, so should you use these in a class ball today for the dinner table decoration it could afterwards become beautiful decorations for your corner table or more permanent decorations in a glass vase on the shelf. To dry out lemons or pomegranates, you simply need to place them near a bright window to dry out on their own. Most dry out beautifully and dried produce last for years. The benefit is that you can mix dried produce, so you can continue adding to the selection and add some to wooden bowls, display them in a variety of containers or decorate concrete planters. 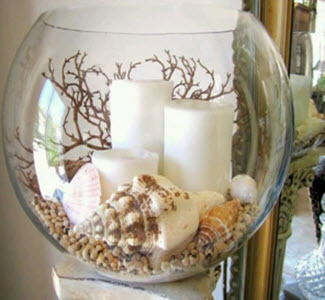 It is not only beach houses that can benefit from seashells, but they also make an interesting display in any home. The easy to collect during the holiday and sensational should your next dinner party be a set of white and blue. It’s perfect to freshen up the table or incorporate a fresh feel, while these are reusable and when they, not part of the table decoration they are awesome to use with candles in any other room such as the bathroom. It is one of the most natural elements used in designing. It can be used with anything else and always reminds of the wonder of nature and the calmness of the ocean. The beauty of blooms and greenery can never be underestimated, and should you feel like having fresh flowers on the dinner table, then do consider drying those afterwards. Dried flowers can be used with fresh flowers or even brighten up by a few clippings of green. For an antique feel to a special dinner setting the dried flowers coupled with lavender are simply sensational, and it adds an element of both nature and simple sophistication. A giant bouquet of flowers still have its power, yet for a classic setting a whimsical fern or few flowers can provide a statement of evergreen, so use the elements provided by nature to theme your next dinner party so you can have some fun decorating the table. It is hard to believe what a difference scattered cushion can make to any room especially your dining room. If it looks a bit tired or just boring it might be because your living room is where everyone dumps stuff or that the continual wear and tear is taking its toll. Often the redecorating task is considered as a major project including new furniture, re-carpeting, re-painting, which could be simply solved via a few colourful cushions adding brightness, playfulness and cheerfulness to a tired space. All the elements of a living room can be pulled together by choosing the correct colours while it can also bring harmony to a previously mismatched room. 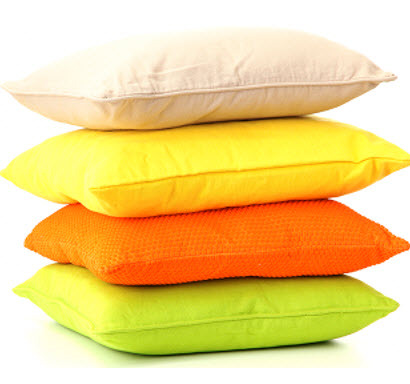 It can be difficult to select the perfect cushions as it is so easy to get it completely wrong. Often individuals purchase a couch that comes with cushions matching it, this is bad and the first step is to donate these to charity. The main goal by adding scatter cushions to a living room is to add colour, texture and brightness to a room, if these match the couch they blend in with it and in most cases makes it looks lumpy. Cushions complementing the couch of other colours already in the room to bring contrast are way more effective. What is most effective in making a drastic change is to match cushions to artwork on the walls. The most important step in adding cushions to your living room or any other room is selecting the cushions. If you select them carefully they can pull together all the other elements in the room to provide both a harmonious and stylish look. Living rooms have lots of patterns and colours in general, what you need to take into consideration is the patterns on the curtains, the colour of the walls, artwork currently displayed on the walls, the carpet, coffee table as well as the trinkets and vases. To enhance the look and feel of the room it is best to select your new cushion based on the combination of colours that are already part of the dining room, where creativity comes in is to subtly pull together all the room elements and to make colours exist to add to each other and complement the room. Once you have a list of the colours of the curtains, couches, walls, and ornaments it is necessary to gain access to a colour palette, decide how many cushions you need and their colour. The number of cushions can be all in different colours or select a base colour such as white with design in different colours. Should your choice be different colours it is always best to stick to no designs to enjoy the brightness of the colours instead of designs complicating the matter. If you are someone with an extremely small bathroom, there’s no need to worry, as we have loads of bathroom ideas to assist you. It doesn’t matter how compact your bathroom is, we are confident that you’ll find a chic design to perfectly suit your needs. 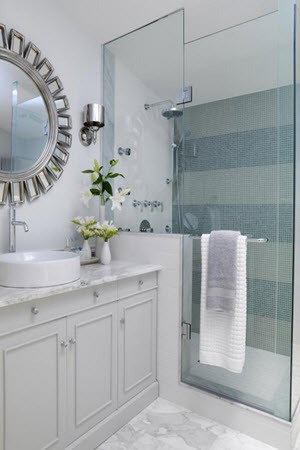 A small bathroom can be practical, stylish, and with the right guidance, space-efficient. The best advice we can give you is to make your bathroom look significantly bigger by utilising neutral colours that run up the walls, along the floor, and even continue onto your loo and bath. This will essentially create an impression of never-ending space as opposed to breaking up the small bathroom into several areas, making the room feel more boxed in. You can also consider installing a skylight to further open the bathroom, creating airy space and more light. White furnishings will assist in bouncing light throughout the room which means you can incorporate personality with a handful of captivating accessories. The key to a small bathroom is lighting. You can include task lighting alongside mirrors or place dimmable light options behind a bath to create mood and drama. There’s absolutely no need to keep a small bathroom minimalistic and plain. If you are someone that loves vintage style, go for it. To stop a bathroom from feeling cluttered, use clever storage compartments to maintain a feeling of sophistication and space. Let’s look at a few more ingenious ideas you can use in a small bathroom space. 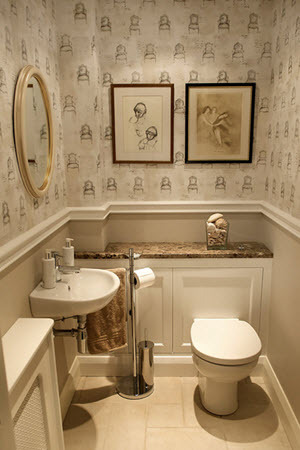 The best way to disguise a small bathroom is to draw attention with a striking wallpaper. Should you have a shower or bath, as oppose to a cloakroom, ensure you purchase a wallpaper that is specifically made for bathrooms that can deal with warm, damp conditions. A limited floor space shouldn’t limit your creative flair. Should your bathroom be on the small side, look for freestanding furniture that will allow you to move it around whenever you feel like it. Freestanding seating and storage will allow you to change the scheme whenever you like, and unlike fitted units, you can easily take the freestanding furniture when you need to move. What the eye perceives and the amount of space you have aren’t always the same thing. Play with the perception boundaries by tiling the wall and the side of your bath with the same tile design. This makes it difficult to determine where each begins which in turn makes the space feel much bigger. Tiered storage stands keep practical wash bags and luxurious packaged lotions on show and it also makes them easy to grab while in the bath. Should space be extremely limited, you can also tote the tiered stand from one bathroom to another when required. Fittings that float visually maximize the space as you can see more of the bathroom floor and it makes it easier to clean the bathroom.